By Julian Lee (Bloomberg Gadfly) — After three years of gloom, the number 100 is finally starting to resurface in the forecasts of market analysts. A slump in new production outside the U.S. shale patch in 2019 could help to send Brent crude briefly back above $100 a barrel next year, according to London-based consultancy Energy Aspects. The International Energy Agency also has a 100 number in its latest outlook, published Friday. 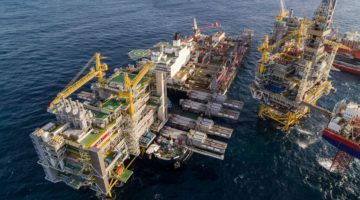 While it doesn’t forecast prices and doesn’t yet look as far ahead as 2019, it sees global demand exceeding 100 million barrels a day for the first time in the fourth quarter of this year. Oil’s slump is over — hail the return of triple-digit crude! Well, maybe, briefly. The IEA, as I noted last week, is much less bullish about demand growth in the coming months than other pundits. For some, this raises the risk that the world’s most-watched forecast significantly underestimates oil use and, as a result, the speed of oil market rebalancing and the upward pressure on prices. Broad-based economic recovery is setting the world up for demand growth of 1.7 million barrels a day in 2018, and there’s a chance that it could be as high as 2 million barrels, according to Energy Aspects. Certainly there’s a lot of expansion about — the World Bank has raised its global GDP growth forecast for this year to 3.1 percent from the 2.9 percent it projected in June. With strong economic momentum in almost every country and region, there is “no real drag on oil demand growth,” Energy Aspects said Jan. 15. But there could be one in the works. Rising prices can have a chilling effect on demand growth, and benchmark crude prices have risen more than 55 percent since their rally started in June. End-user retail prices are feeling this. U.S. gasoline and diesel are both the most expensive they have been at this time of year since 2014 and, in contrast to the normal seasonal pattern, pump prices are already rising. The same is true in Europe. Strong demand growth in the developed countries of North America and Europe in the first half of 2017 was “largely attributable to lower prices,” the IEA says. Drivers are unlikely to benefit from similar price moves this year. What happens to car owners in rich nations isn’t the only source of strain on demand. Many developing countries took the opportunity of the sharp fall in prices to reduce subsidies on oil products, which could amplify the impact of higher crude on what end users pay. The IEA also sees a big rise in oil production this year, including “explosive growth” in the U.S. With the pickup in non-OPEC supply exceeding the increase in demand, it sees the world’s need for OPEC production falling by around 600,000 barrels a day compared with last year, to a level below last month’s output. The implication of that for prices is clear — if the IEA is right, the possibility that oil reaches $100 a barrel is remote.